You can, if you don’t mind, start off by telling me about your video. 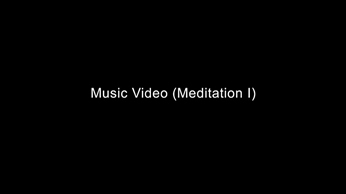 The video I made for the ‘Communism of Forms’ is called Music Video (Meditation I). 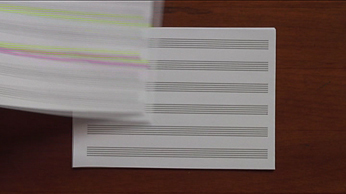 It begins by showing a small pile of music score paper on a table. The sheets are blank. 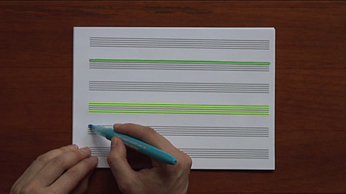 Then I start to get marker pens of different colors and trace horizontal lines on the sheets (in the spaces for music notation). When I finish one sheet, I change for the next one and continue the same procedure for a while. It ends with a blank sheet. The video has no sound. The idea of the work was to explore relations of time and process, relations between music and visuality (for instance, how concepts of intensity and duration vary in these two areas), and leave a space for the viewer to imagine a possible music resulted by the composition with colors and by the drawings made on each sheet. I was also thinking about speed: I find that a lot of music videos and pop culture worked at a ‘high speed’ — images that overlap one another multiple times, the exploration of image-effects, the idea of reproduction, the speed of visual information… and I wanted to make something that is quite the opposite — a more meditative, quiet, and contemplative gesture. those are some interesting comments. 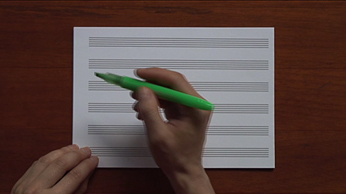 I am wondering if you can comment more on how you see the relation between music and visuality, especially in light of how it could relate to music video (some of the exhibited work will be direct illustrations of musical scores/songs like a music video). I am also wondering how you see your work may be read if it is in an exhibition that contains much faster edited work. I didn’t worry about making a work that relates to an ‘aesthetics’ of most music videos, nor to the language of music videos itself. Instead, I opted for playing with the definition of music video, which could be thought of as a short video that accompanies a piece of music, usually a pop or rock song with lyrics … a video that is made to ‘illustrate’ or to promote a song. 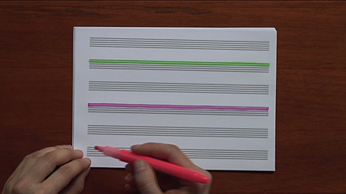 I wanted to subvert this so I opted for making quite the opposite — I’m making a video that suggests the creation of a piece of music as it unfolds; yet it is a silent work and ‘music’ is suggested only by the use of colors, by the spaces that I fill in on the score sheets and by the resulting ‘drawing’ / image on each page. I wanted to think about relations of music & visuality in a more experimental way, resembling investigations of artists like Kandinsky and John Cage. 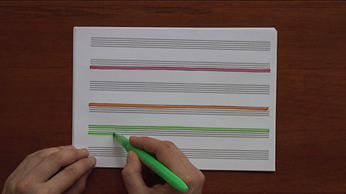 For instance, how color can be explored as a representation / translation of music to a visual form, and how written representation of music can assume forms other than the more ‘classical’ or usual way of music notation. So I expect the audience of the exhibition will read my work as a more contemplative piece and as one that leaves space for different connections and interpretations. Some interesting points you have made about your work. I am particularly interested in what you have to say about Kandinsky and music. As I recall from art history classes, Kandinsky sought to achieve a level of abstraction visually that, in his opinion, had only been done musically. 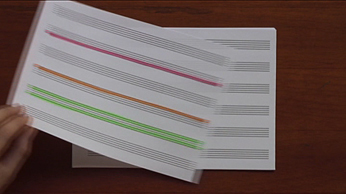 It is interesting to me that you are trying to bring across the sense of music through color in a way that is much different than the formalism of modernism. I am wondering if you can think of other artists over the last several decades that have approached this issue. 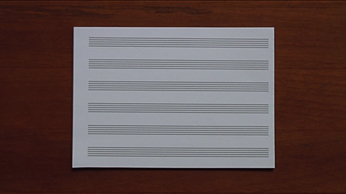 Certainly in terms of the score paper images, Hanne Darboven is an obvious reference. Has her work influenced you? No, I didn’t know about Darboven’s work until you mentioned it to me. 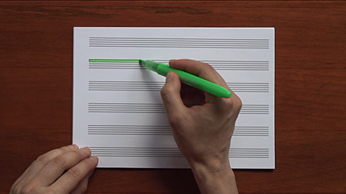 I can’t think of other artists that have approached this issue either … I mean, even Picasso has used score paper in some of his works but in a very different way and with very different purposes. Maybe Paul Klee could be a closer reference, although his work has not influenced my video in a direct way either. In the evolution of music representation, the use of visual symbols and signs demonstrated the need of composers and musicians to make visible the ephemeral character of music. The correspondence between colors and sound gives seeing and hearing a symbolic dimension in a spiritual sense. Kandinsky, yes, he used elements of music — like temporality, improvisation, and abstraction — to create a new genre in painting and to establish a bridge between visual arts and music. But the interesting thing is that his ideas were not intended as a mere association between these two fields, nor just as a representation of sounds. He sought to listen to the essence of music — not to adapt it to painting, but to be able to listen the painting itself. So it was not a question of what is visible during the hearing, but how it appears, how it can be evoked, and under which forms something is capable to evoke what is not present in an explicit way. That’s what interested me most. I am especially interested in what you have to say about ephemerality and evoking what is not explicitly present. In terms of a music video things are presented explicitly and quickly — and that does not allow for one to see the gaps and nuances between music and image. I am glad that your work addresses this. I think it also draws back to the very formal structure of musical notes that led to a music video in the first place. It is, as you say, a way of anchoring what is ephemeral. 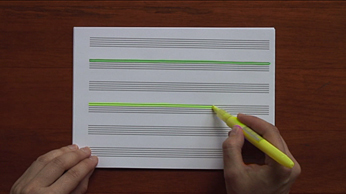 Your work frees up this anchoring; in other words, it reminds viewers just how ephemeral music is. Music videos are not intended to be ephemeral because they are meant to stay in the mind of the viewer but they become so because there are so many of them. Your work in contrast is ephemeral by way of bringing colour into it. I think this contrast of types of ephemera stresses that your work is sharply different from commercial music video, and this will make the piece very refreshing to see. What do you think of these ideas? One more question — the simple premise and image of the work reminds me of video art in the early 70s more than work I see today (generally). Is this an accurate assessment? Are you influenced by early video art? Very interesting points you’ve made. I’ll try to answer to your questions. Yes, the simple premise and image of the work are reminiscent of early video art, although I’m not influenced by it directly.  The videos I’ve done so far, including this one, were shot with a stable camera, the camera did not move. The ‘scene’ that was filmed was very simple, some videos are not edited, and all are very low-tech — maybe that’s why they remind of early video art. I haven’t been interested in exploring the technological possibilities of video nor in dealing with the conceptual agenda investigated by video artists. Maybe because I’m not a video artist … I’m more interested in using video to talk about time (and not so much about space) and to create metaphors through very simple ideas. I also agree that the work is very different from commercial video, and it’s very nice to hear you find it refreshing to watch! I will be happy if the audience finds the same! Through my works, I’m often trying to create a moment of silence for the viewer to be with him/herself. I mean, my works are not about the spectacle; in order to engage with them the viewer has to stop for a while and try to see what is beyond a first glance. 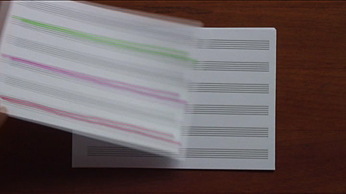 I don’t see the work necessarily as being ephemeral/talking about the ephemeral … Perhaps in terms of reminding how ephemeral music is, and how ephemeral things in this world are, yes. The piece surely talks about time, process, passage of time, and maybe transience. I see a relation between these and the concepts I mentioned in the previous paragraph. Having visited last year, I think I was influenced by Japan when I made this video! Some aspects of Zen thought, some Japanese gardens I visited … The sub-title of the work — Meditation — came after I finished the video. 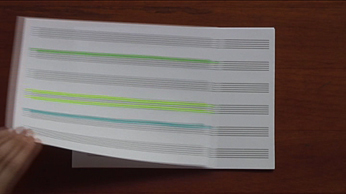 I found the process of drawing the colorful lines on the score paper very meditative, and the result meditative too. And some memories of Japan also played a role in it. The idea of working in low-tech video because you are not a video artist per se is not an uncommon strategy, but I think it is particularly effective here if you are speaking of time. Time is important in dealing with music video because I think that its fast editing has had a subliminal effect on our culture — faster and faster images leading to shorter and shorter attention spans. People get used to the speed and therefore do not think of alternatives senses of time. Of course, this ties into how capitalism has seized electronic media as a way of speeding up the pace of information to maximize profits, at the same time leading to a restless society. I think it is important for artists and others to question this kind of pace and, as you say, spectacle. I hope that yours and other works in The Communism of Forms do raise this. One final question: When you talk about low-tech video, the reference point for me is YouTube. Do you see YouTube as a possible venue for art or as something that will naturally be referenced in art whether artists intend it or not simply because of its all-powerful visual presence? Anyway, some thoughts. I totally agree with what you said about faster and faster images, followed by loads of information and their impact on culture and society. Contemporary society has got used to high speed (not only in visual culture but also in life), and building an alternative sense of time has become a challenge for most people. I believe artworks can provide a respite from this condition, if the artist consciously chooses to work with another sense of time and if the audience is open to experience it. Concerning YouTube, yes, I see it as a possible venue for art, and especially as a new source for the distribution of videos and experimental works. YouTube made it possible for anyone with a computer to post videos that can reach a huge audience. It has significance to visual culture and arts. But again, it’s a matter of knowing how to separate so much information and pick up those that are worthwhile. A lot of people confuse knowledge with loads of information, and forget about the quality of the information. Well, I finally got to see your video. It will work well in The Communism of Forms, as I thought it would from your description. Definitely. When I saw it, what I think stood out was how clear (but not overly clear) the colour’s relation to (or metaphorical stand-in for) sound actually was. 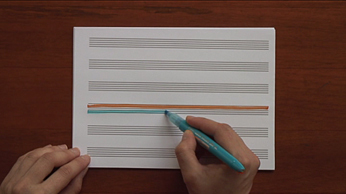 I thought before seeing it that the relation of colour to music would be more abstract. So, I ended up actually feeling more excited about the work after seeing it. 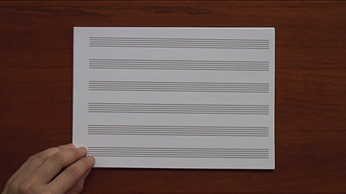 I still think of Hanne Darboven. 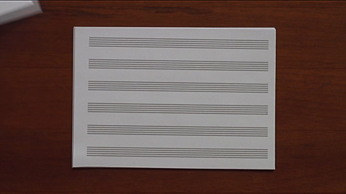 Also, the score lines looked to me as if they were sculptures — a kind of Donald Judd type minimalist configuration. Not quite what I expected, and maybe I will be the only one who thinks this (LOL).